You never know at what point people will accept their treatment. 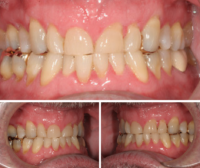 The patient in this case was diagnosed for a full mouth rehabilitation three years before starting his treatment. While we diagnose patients for treatment who exhibit clear clinical indications, oftentimes it is the timing that makes the difference between acceptance and non-acceptance. In my practice, my entire team is dialed in to ultimately giving a patient what they want. This means we perform comprehensive and complex dentistry in our practice but only when the patient is ready. Maintaining a great relationship with the patient during their hygiene appointments and caring for emergent needs allows us to support a great outcome while still taking care of their priorities. The patient’s primary goal was to lengthen teeth and regain ability to smile. The patient had severe anterior wear with vertical dimension and bite collapse due to posterior hit and slide avoidance. He had also lost all anterior guidance. He was partially restored with lingual pin-retained gold onlays to hold canine guidance. He had muscle soreness and a joint discrepancy due to disc displacement, vertical collapse, and severe occlusal imbalance. We planned to increase VDO, re-establish joint position, and balance muscles. The patient was deprogrammed prior to new bite position. In the patient’s final position he was raised 3+mm. 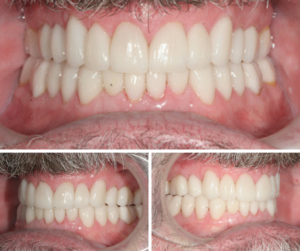 Gold Dust Dental Lab fabricated Empress Esthetic restorations on the maxillary teeth. The lower anterior 10 and the lower 2nd molars were prepared for e.Max Press restorations. How do you help your patients on the path to case acceptance? We’d love to hear from you!